Just a quick post to announce the winner of my Curl Wand giveaway!!! So, who got lucky? Keep reading to find out! 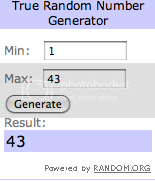 Congratulations to #43: Linda!!! Linda, I just emailed you to request your address. Please respond within 48 hours or a new winner will be selected. Thanks to all who entered! Keep checking back often as new giveaways will be posted very soon!